Western blot analysis of RGPD5 in EL4 cell lysate with RGPD5 polyclonal antibody ( Cat # PAB13365 ) at ( A ) 1 and ( B ) 2 µg/ml. Western blot analysis of RGPD5 in EL4 cell lysate with RGPD5 polyclonal antibody ( Cat # PAB13366 ) at 1 µg/ml in ( A ) the absence and ( B ) the presense of blocking peptide. Western blot analysis of RGPD5 in EL4 cell lysate with RGPD5 antibody at 1 µg/ml in (A) the absence and (B) the presence of blocking peptide. 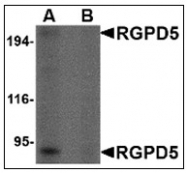 Western blot analysis of RGPD5 in human thymus tissue lysate with RGPD5 antibody at 1 ug/ml. 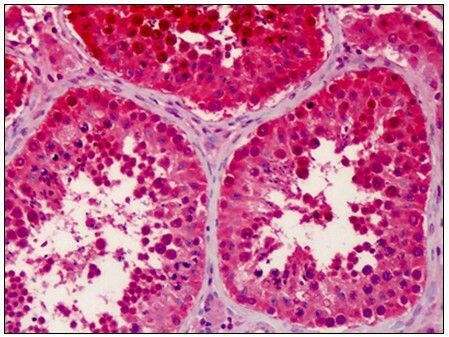 Immunohistochemistry of RGPD5 in human testis tissue cells with RGPD5 antibody at 10 ug/ml. Immunofluorescence of RGPD5 in human testis tissue with RGPD5 antibody at 20 ug/mL. 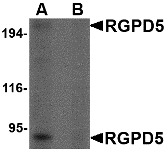 Western blot analysis of RGPD5 in human thymus tissue lysate with RGPD5 antibody at 1 µg/ml in (A) the absence and (B) the presense of blocking peptide.